You will earn 3,866 Reward Points. Earn 1 reward point for every 1 dollar spent. Keep your food items fresh and chilled during your food prep with this Beverage Air SPE72HC-30M-DS Elite Series? Dual Side Mega Top Refrigerated. This worktable is 46.50 inches tall, 72 inches wide, and 48.63 inches deep. Dual Sided Prep Table Cabinets are accessible from front and back. Fifty percent greater pan capacity than the all around standard prep table. Features enhanced refrigeration system and new and improved grille system for better airflow and less temperature gradient. 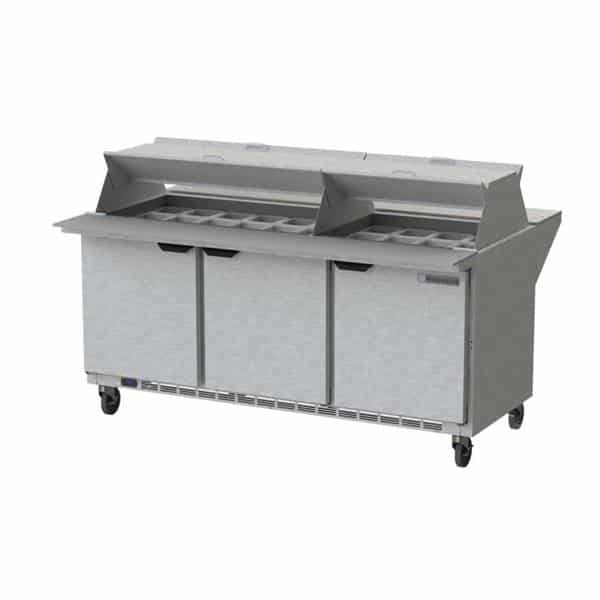 Removable hoods and insulated lid(s) assemblies are made of matching stainless steel. Six-inch casters, 2 with brakes, are standard. 3-inch casters and 6” legs are available as an option. Exterior construction includes heavy-duty stainless steel finish on front, back, sides, top, and door(s). Doors are mounted to face of cabinet on cartridge style hinges permitting them to self close. Hinges also allow doors to stay open 120°. Two epoxy-coated steel wire shelves per section are supplied as standard. Pans furnished are 4” deep and made of polycarbonate plastic. Door handles are made from extruded aluminum with a black anodized finish. They are contoured to permit easy opening of doors with fingers from both top and bottom of handle. One (1) 10” deep and one (1) 12” deep, full length removable cutting boards constructed of high-density white polyethylene plastic are supplied with cabinet. These are readily removable for cleaning. Systems are designed using CFC and HCFC-free R134a refrigerant and capillary tube between condenser and evaporator.